Fire, water, and other disasters can cause power loss and disrupt HVAC systems. Without power, your business cannot operate. Without heat or cooling the temperature in your home can become unbearable. Fortunately, Clean Masters provides emergency temporary power and climate control solutions for your home or business during a disaster. Whether your property has been affected by water, fire, or some other disaster, temporary power and climate control can make a major difference. We understand how important it is that your business continues to operate during a disaster. With our temporary power services, you can continue serving the needs of your customers without interruption. We also understand how difficult it can be to live in a home without power for your appliances or heating system. Clean Masters offers temporary power through portable generators. We can also provide temporary air conditioning or heaters to maintain your property’s indoor climate. 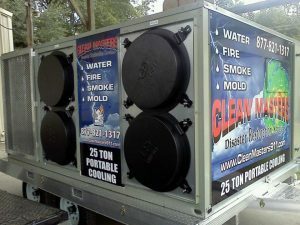 Get peace of mind when you contact Clean Masters for all of your temporary power and climate control needs, 843-821-1317.